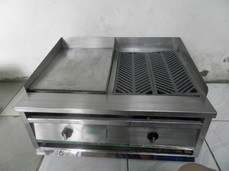 Combination griddle and griller, table type, stainless steel, brand new , with drain pan, heavy duty for commercial / industrial use. LPGas operated. Also available griller with volcanic rock. Dimension: 24" x 32"., single h-type burner griddle, and single h-type burner griller. Are you looking for that quick and easy dessert recipe? Here are some ideas using agar agar from traditional desserts and more.